In a cobbled cul-de-sac just off Calle Bellido, our 'casa' has all the benefits of the centre of Vejer but is also in a quiet and safe residential location. Round the corner is one of the best bars in town with excellent tapas, and round another a very friendly general store. The market, the supermarket, the internet shop, banks, and the many bazaars, are all within walking distance. We have wonderful views over Vejer from the living room, main bedroom, balcony and private roof terraces. There are two double bedrooms with sleeping space in the living room for extra guests. Renovation was completed in April 2009 to make a very smart home with European and Moroccan furniture. A wrought-iron spiral staircase from the large dining/kitchen leads to a roof room accessing two spacious terraces both with Moroccan mosaic-topped tables, a range of chairs and places to relax, and awnings. I live in Somerset and work part-time for The Open University. My son and my daughter are both teachers in secondary schools, my son in London and my daughter in Bournemouth. We purchased our property in 2003 when we fell in love with Vejer while holidaying there over Easter. We finally saved enough money to renovate and furnish the property in 2009. We visit with other family members and friends as often as we are able, but are also very happy to share our apartment with others through Owners Direct. I holidayed on the Costa de la Luz with my children (actually young people now in their early 30s) about five years ago - and we fell in love with Vejer. The town is charming. It is just ten minutes from the coast, wild, unspoilt with vast stretches of sand, dunes, wild flowers, rolling seas. Drive the other way into the Serra de Grazalema, cork forests, eagles, wild boar. Together we bought an apartment which then was two small apartments. We saved and finally during 2008 and 2009 we had an architect design the renovation and make the two small places into one. Building work started in September 2008, furnishing the renovated apartment started in February 2009 and it was ready to live in in May 2009. We chose this particular apartment because it is in the centre of old Vejer, has two roof terraces both with wonderful views over the town, but it is also quiet and really safe. We enjoy the neighbourhood, the local corner shop and Pedro's bar, and our Spanish neighbours are really friendly. Bathroom with washbasin, toilet and spacious shower cubicle. Through an arch from the kitchen is the living room situated between the two bedrooms, TV (Spanish), DVD, games, books. A pull down double mattress in a wall mounted fitting for extra guests. Double doors onto balcony looking over patio and Vejer. Montemedio Golf and Country Club is just a quarter of an hour's drive from the house, described by Seve Ballesteros as one of the best in Europe for quality and landscape. There are also golf courses about a hour away at Benalup, Sancti Petri, Montecastillo, San Roque and Valderrama. Notes on accommodation: Room fans and ceramic wall-mounted heaters are provided although double-glazed units within traditionally-designed wooden windows with shutters (and blinds for the bedrooms) retain warmth and coolness. While we have provided a travel cot for babies and very young children, our home is not really suitable for children who would need to be supervised on the balcony and roof terraces. The roof furniture and retractable awnings on the roof terraces need to be folded away at night and in windy weather. Plastic bags of rubbish are collected from outside each night except Saturday. We have wi-fi throughout the apartment at an additional charge of 12 euros for one week, 18 euros for two weeks, 20 euros for one month, payable to the Internet Shop in Vejer, in cash or through PayPal. Outside: There are two spacious private roof terraces, both with retractable awnings and roof furniture, both with wonderful views over Vejer. One has washing lines. A roof room houses fold-away chairs, sun beds and cushions, a barbecue and crockery, cutlery and glasses for use on the terraces. It also has a small fridge for drinks and snacks. Utility Room: Roof room houses washing machine, small fridge, crockery and glasses for use on terraces, barbeque, sun beds, folding chairs and cushions for terraces. Cleaning / Towels / Linen / Maid service: Egyptian white cotton bath sheets, hand towels and flannels, beach towels and tea-towels are included. Other: A store room houses a travel cot, picnic chairs, cool box with picnic plates etc, beach towels, ironing board and iron. 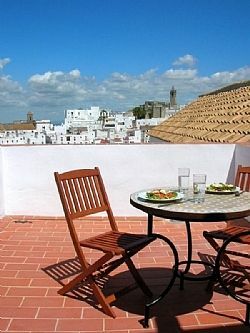 A wonderful place to stay in Vejer! The owners are so accommodating and helpful during our time there! We have just spent five days in Vejer in this property. The apartment is perfectly positioned for both the historic centre and the more modern town and all amenities are a short walk away. The roof terrace is to die for, and everything in the apartment has been well thought out. Even in January Vejer offers a variety of eating out possibilities, from gourmet but inexpensive tapas at El Punto to La Califa, the Moroccan restaurant - again at reasonable prices. Cadiz and Jerez are an easy day trip away and sandy beaches are 15 minutes drive. It would be hard to beat this property or the town and we hope to return before long. Beautiful apartment with fantastic amenities. A wonderful host. Thanks for staying with us. Come again! We stayed at Angela's gorgeous place at the end of July 2018. My family(husband and 3 grown up daughters) had a wonderful time. Of course the weather was fabulous but so was the property. It was clean and well equipped with lovely views from the 2 roof terraces and very well placed in the village to explore on foot. Angela was easy to contact and responded quickly when I admitted to breaking a glass!It was very easy to find parking nearby. We hope to return, it was certainly a great choice for a first trip to Spain. Wonderful to return to property and enjoy Vejer and surrounding area again. Lovely, well equipped property, well located with great views. Short drive to fantastic beaches. Lovely well-equipped apartment in a typical Andalucian hill top town. Lovely apartment in a great town perfect for exploring the great West coast of Spain-stayed here many times and highly recommend the town and the apartment. Thanks James. Pleased you enjoyed your return visit to Vejer. Look forward to you staying with us again. The coast and beaches of the Costa de la Luz are wonderful, wild, unspoilt, ever more bays and secluded beaches to be discovered. El Palmar, Los Canos, Cap Trafalgar are both about a quarter of an hour's drive. Wind-surfing, surfing, etc and horse-riding are all possible. There is a newly constructed covered swimming pool in Vejer. Jerez (RyanAir from Stansted) 45 minutes drive. Gibraltar (MonarchAir from Luton & Manchester) 1 hour drive. Seville (RyanAir from Liverpool, Bristol etc) 2 hours drive. Malaga (everyone from everywhere) 2.5 hours drive. We recommend hiring a car and would be pleased to recommend companies. Our 'casa' is a couple of minutes walk to the nearest tapas bar (which is excellent), a general corner shop and the bakery, five minutes to the market, the supermarket, the internet shop, banks. It's about ten minutes to the Plaza Espana. or just wandering the narrow flower-filled streets of Vejer calling in to the many shops, boutiques, tapas bars. Booking Notes: Payments may be made by cheque, direct bank payment or through PayPal to UK owner). If you choose our 'meet & greet' service (50 euros), this ia paid on arrival to our friends who help look after our home for us. They will guide you to our home, help with car parking etc - a service much appreciated by our guests. Changeover Day: We are flexible regarding your length of stay and day of arrival and departure although we do suggest a minimum stay of four nights. Notes on prices: We are pleased to discuss with you discounts for longer lets during low season times.